I need to start by saying, that my list of top 10 reasons have not been audited by a major accounting firm, nor have I used a survey heavy hitter like MORI to develop it. Instead, I have relied on something much more tangible, the more than 20 years that I have worked with home buyers in the Lake Chelan area, which in my books tells the real story of why people fall in love with Lake Chelan. 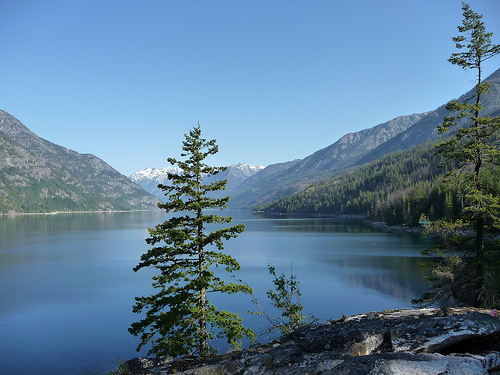 Lake Chelan is a 55 mile, narrow glacier filled lake in the middle of Washingon State. Here is a photo montage, created by Go Lake Chelan that shows the wide range of lake side properties. These are not cookie cutter properties, rather, individually crafted structures that blend beautifully into the landscape and take full advantage of the beautiful vistas available. See some of the properties currently on the market. Most people focus on our 300 days of sunshine and why shouldn't they. If you've spent most of your life west of the Cascades, it's a wonderful treat to see the sun, and almost unbelievable to think that North Central Washington residents are spoiled with warmth and sunshine through out the year. 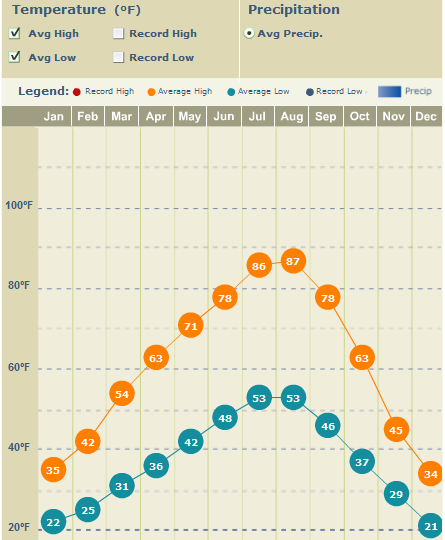 To even make it more attractive, the air quality, a result of proximity to the lake, low year-round populations, altitude combine to give Lake Chelan pristine air quality, unless there is a fire as there was last year, but even so, Chelan's air quality was much better than all the surrounding region, and many outdoor sporting events were rescheduled to take advantage of the conditions. I would love to show you the an air quality map, but it would appear that the maps are created to serve people living in areas with moderate or low air quality. It doesn't really matter where you look this area is beautiful. Green and lucious by the lake year round, with browning hillsides over the summer. Here are just a few of my favorite vistas. In my next post I will write about reasons 5 (small town charm) ,6 (outdoor recreation), and 7 (fresh grown, organic produce). For those that already live in Lake Chelan this recent news clip, from Komo News is nothing new, Lake Chelan is the hidden jewel in Washington state that beckons travelers with a glacier fed lake (fifth deepest) in the United States, unparalleled weather (over 300 days of sunshine a year) and a robust and growing wine industry. For those of you that are less familar with our wonderful valley, this short, four minute clip, really highlights what makes Lake Chelan so captivating and why many families come back year after year to visit. More and more people are converting their summer homes to full time residences, and you can see why, with the captivating beauty and old charm combined with all the modern conveniences. I have been selling real estate in the Lake Chelan area for over 20 years and would welcome the opportunity to show you the range of properties available, and give your a personalized tour of the Lake Chelan region. You will soon see why people fall in love with Lake Chelan and choose to live here year round. What do I do with my fireplace in the summer? One of the best things about living in North Central Washington, and in the Lake Chelan area in particular, is the that we have four distinctive seasons – Spring, Autumn, Winter and my favorite Summer, which is just around the corner, where the temperatures, already beginning to warm will begin to become downright summer like, and the nights will extend, until the summer equinox in mid-June. One of the challenges that many home owners have, is during the summer months, when the house warms up, and there is a bussle of activity outside, what do we do with our fireplace, and hearth, most often times found at the center of our home? Do we just leave it to collect dust, seemingly forlorn and alone, or do we take full benefit of the center piece that it is and accentuate it's beauty? If you are thinking about showing your property, then there is no doubt what the right answer is – you must dress it up and make it the accent piece that even in the summer can bring your room to life and offer a renewed vitality to your room. 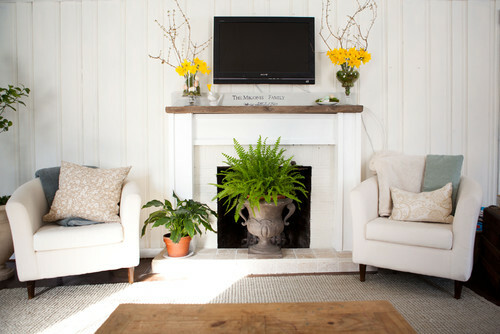 One of my favorite recently published articles in Houzz, 14 Ways to Style Your Mantel for Spring and Summer has some great ideas and pictures that really demonstrate how effective dressing up your fireplace can be. My favorite is shown below and shows just how easly it can be. In this case the strategic placement of a large houseplant accented by floral arrangements, either fresh or silk on either side on the mantel. This simple yet elegant treatment really brings life to the room, and will reinforce the value of the property. I have mentioned a couple of times over the last several months that the housing market in the Lake Chelan area is definitely on the rise. If you are thinking about selling your property, please let me know, as I would be honored to help you sell your home. You can contact me on my cell (509) 679-1941 or by e-mail. Why Buy a Home in Lake Chelan Now? House prices are on the rise, and available inventories are shrinking, in most major markets. Imagine sitting on the sun deck reading a novel and sipping a fresh latte. Life doesn't get much better than that. And with 300 days of sunshine, your dream can easily become a reality. It sure beats, the grey, rainy days that many Washitonians endure. With the change in work habits, and excellent high speed internet services, you can live and work, in the idyllic beauty of Lake Chelan. I have worked with many couple who have wanted to find balance in their lives and crave the warmer, sunnier environment that the Lake Chelan region has to offer. If you give me your hit list, I will come back with a list of properties that will delight and surprise you. 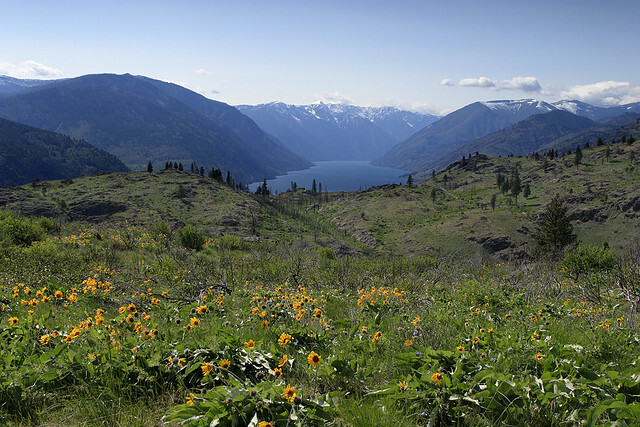 Come live the life you've always dreamed of here in Lake Chelan. This is a picture taken from the foothills overlooking Lake Chelan. You can see how beautiful it is here, and why so many people consider either moving to this area, or purchasing a second property here. Lake Chelan is my home, and I have been in business of finding people their dream property for over 20 years now. Picture of the mountains surrounding Lake Chelan, WA. 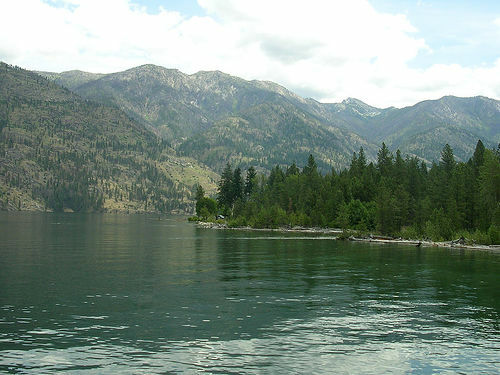 It is not just the gorgeous hillside vistas, or the glacier feed lake, or the full range of outdoor activities that are available in the Lake Chelan area that make it one of the most sought after real estate markets in Washington, it's the small town, and neighborly greetings, that make Lake Chelan an idyllic place to live. Did I mention the weather? Lake Chelan has over 300 days of sunshine a year; a record for Washington state, and in the summer months there is less than an inch of rainfall a month. I excel at finding properties that tick all the boxes on my clients wish list – from bedroom size, to amenities, waterfront, garden style and so much more. I would love the opportunity to take you a tour of properties that I have hand picked for you. As a registered agent I have access to all the properties available in the Lake Chelan market and will find just the property that meets your needs. 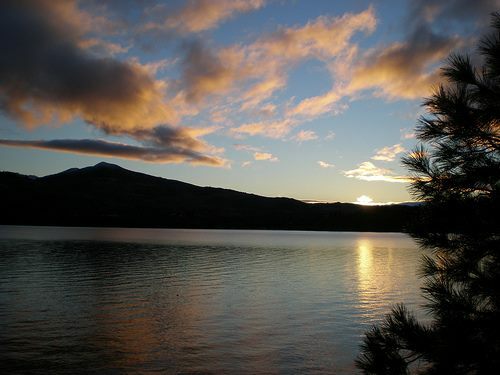 I look forward to meeting you and showing you all the best that Lake Chelan has to offer.